RIZALINE, my eldest child, may have resigned to her fate to face life under single blessedness. After all, on both maternal and fraternal side, there are spinsters and bachelors. She may be at ease on which side she would prefer. After all, I have prepared her intellect to subdue every philosophical concern she may encounter. She is beautiful and only morons would ignore her. She is an A-lister in her student days and a very responsible worker in any employment she may take fancy on. On top of that, she is an ardent advocate of nature, always atop the mountains, exploring the bounties of innate resources. Matrimony may have its attractions but she would rather concentrate on her beliefs. She was busy with her peers, all naturalists on the side and professionals in their upbringing. All of them are also unattached. Then the unusual happened. Her mother, a health buff and a very conservative person, very religious and almost scrupulous on cleanliness contracted the big C—-an ailment only for those who embraced lifestyle abuse. It was an impossible ailment for the lady but in a world that changes every now and then, include climate change for that matter, everything probable can only become possible. And there it was, medical science has diagnosed the mother as such and from there, the mother was at the centre of wishful instructions. The mother decreed that the eldest should already tie the knot. She wanted to see her first born already settled. It was deaths wish which must be reckoned and reckon my dear child must have done. She was engaged to Aaron Paul Santos, a dashing gentleman, about her age, in their 30s and still determining if marriage would be their convenient decision. They have as yet to fully understand a life away from their respective neutral family. Living on their own is still a matter to analyze. Both are gainfully employed though, both are eldest in their respective broods and both are responsible elders in their own families. Marriage is a perfect decision. The day it was decided was one of dilemma. They may have wished to carry it out on a later period, after a protracted friendship but they were torn on a date on which it must be conducted. The mother of the soon to be bride wishes to have the nuptial in two weeks. For serious workers like the couple who never wanted to have absences, this would mean sleepless nights to work on. And they did. After two weeks, the arrangement was fulfilled. Announcements, organized trips, involvement of friends, busy as they were, church requirements, clothing, invitation, reception, all were taken cared of. 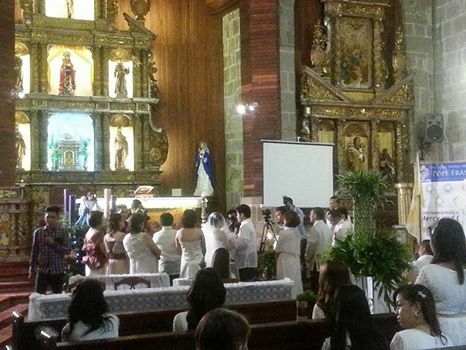 The venue was the historic St. James Church, the oldest Spanish Church of Laguna, situated at the foot of Paete. It was the hometown of the mother and every maternal relative were up and about. The parents of the groom could only accede with the arrangement and gamely trek, along with all relatives from both families, in that remote town famous for its world class wood sculptures. November 29, 2014, Saturday at 2pm came to be as the matrimonial fulfilment of a mother’s wish and an emblem of a future relationship only my dear child and her beloved would be able to jointly comprehend.